For those who want to start camping but are reluctant to jump in, tent camping can be the perfect way to get started and test the waters. You often can borrow much of the equipment you’ll need such as the tent, sleeping bags, coolers, lanterns, and cookware. 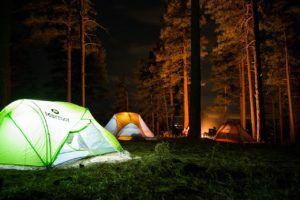 This give you the ability to try it out before you make a big investment in camping gear before you know if you’ll like camping and, if so, what kind of camping you’d like to do. Today’s tents are designed much better these days and they are far easier to set up than tents from days gone by. Many of them will pop up quickly so you don’t have to deal with all the tent poles and stakes. They are user friendly for campers with all levels of expertise and are fast becoming the most popular kind of tent to use. Once you’re set up in the campground, the real exploration can begin. You can now enjoy the act of camping and decide if it’s a good fit for you. Grab the kids and head for the pool or start a game of flashlight tag in the evening. Light your campfire and cook up some s’mores. You’ll wake up in the morning and find your daily routine is very different from the one you have at home. From sleeping on the floor to lighting a campfire for making breakfast, camping can be a challenge. Give it a few days, though, because the “roughing it” will grow on you. After a few days, we’re sure you are going to find that you love the silence of sleeping outside at night, the sound of the birds waking early in the morning, and the feeling of total relaxation that comes from being in that camping environment. While you are there, strike up conversations with other campers who are in pop-ups, trailers, motorhomes, and cabins. Campers are so friendly and most of them will willingly share what they like best about their mode of camping. You can explore other modes of camping and it will give you a good idea of what will work best for you and your family. You may find you love the tent life or you may decide an RV is the way to go. Others find that renting a cabin is the best of both worlds. Starting with a tent and gear that is borrowed is a very good way to begin and then, 25 years later, you can tell your friends about how you started in a tent and share the fun stories of your experience. We look forward to seeing you around the campsites so be sure to check out our member parks. We hope all your experiences are fun ones.